From here: http://unfollowingjesus.com/ check it out. Theoretical physics is always dicey to call on as any kind of evidence. It’s formula and calculations of the most rarified type. My opponent has claimed that one of these hypotheses supports the claim of a beginning to the universe. This theorem is the Borde Guth Vilenkin theorem. He also claims that: “You offer me some fringe models that seek to avert a beginning and remain agnostic about the beginning.“ in reference to those hypotheses that I have cited. Unfortunately for my opponent, this theorem is no more supported then brane theory, etc. It becomes “those unproven hypotheses that support me are okay but those that show my claims possibly wrong are “fringe”. Nice bit of hypocrisy there. It does not say that the universe must have a beginning, it says that one needs physics that do not include inflation to describe the past. Indeed, the authors say the following which entirely demolishes WLC’s lies about their paper “Whatever the possibilities for the boundary, it is clear that unless the averaged expansion condition can somehow be avoided for all past-directed geodesics, inflation alone is not sufficient to provide a complete description of the Universe, and some new physics is necessary in order to determine the correct conditions at the boundary . This is the chief result of our paper.” Aka new physics is necessary, not a god or a beginning. After asking *again* “do you deny the beginning of the universe and if so why?” and again “But how is it compatible with a universe that comes into being?” , my opponent says “The atheist should bravely face the full implications of their worldview, to not do so is hypocrisy (also known as inconsistency). If you examine your beliefs and their implications carefully, that’s a good thing.” Of course, this Christian has yet to show any inconsistency of atheism not needing a beginning or lack of beginning to the universe and has ignored every argument put forward by me. He attempts to imply I have not “bravely” faced the implications of his baseless assumptions. We’re getting closer to the end game now and the death spiral commences in earnest. We have this question from my opponent “But tell me, how does physics work before the beginning of a physical universe? (hint, you don’t need to be a physicist to answer that question).” This is where he wants to claim that there was “nothing” outside of the universe but his god. By this point, I was very happy and a bit giddy because this discussion was turning out so well and I knew I’d get a good blog post from it. Of course I asked him for examples of this “embarrassing arrogance” and “disrespect”. None are forthcoming: “I don’t know what to say, or rather where to start.” Convenient, eh? I invite the reader to see if they can show where I am suddenly “embarrassingly arrogant and disrespectful”. Perhaps we can help this Christian. So here we are, at the end of a very typical debate between an atheist and a Christian. The subject can change e.g. the biblical flood, the ontological argument, creationism, and the steps will be much the same. There will be attempts to get a different answer to the same question; misrepresenting scientific papers, false claims about what the atheist has done, refusal to answer questions, etc. There will also be claims of how mentioning anything that the apologist doesn’t want to address is being “off topic” (similar to how the Texas GOP members declared that talking about Planned Parenthood and ultrasounds were “off topic” to a filibuster about abortion). It is rare that a discussion like this is ended amiably. I have had that happen, but it generally ends as this one has. The apologist is sure that some “other” atheist will humbly admit that his arguments are true and give him the “respect” he believes he deserves. Since an atheist by definition does not agree with the theist, that is a vain hope. As I have said before, respect is earned, not freely given. If I am to respect a claim, then that claim must be supported. And if it is “arrogant” to require evidence, then I am “guilty” as charged. Since we cannot observe beyond space and time, it’s impossible to prove or disprove God. So, in your opinion, why do they keep trying? My opinion is that it is a very addictive idea, that some omnipotent, omniscient being cares for you and only for you. Humans seem to love to think themselves special, and religion feeds that desire. It’s very hard to give that belief up. Another observation is that this need for evidence and proof on the part of many Christians belies the “faith” they claim to have. If they simply had faith, they wouldn’t care what atheists thought. But they care very much about we think. For example, the Christian I debated really wanted me to agree with him, even with deism only. The very fact that atheists exist puts their claims in doubt, since no one should be able to resist their god if it existed. Religion depends on herd agreement. Ah, in my discussions with ::edit:: Chrisitan’s name, i showed him exactly that the theorists he so quickly cites flatly disagree with him… and he IGNORED it completely. It’s when I lost my patience with him. Clearly he’s not interested in dealing with the real world. Instead he plays his WLC games and quite frankly that’s not worth wasting any time on. 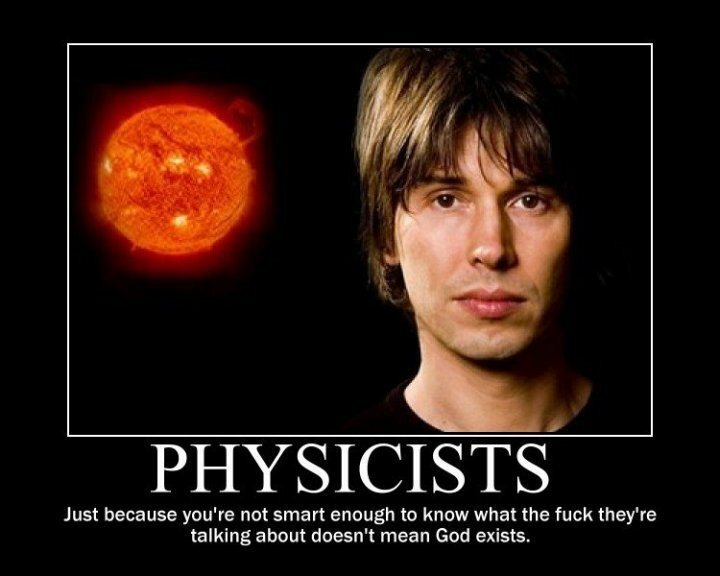 It’s the reason no real physicist will debate Craig any more. They’ve had enough of the BS, and rightly so. ::mod comment, removed Christian’s name so he may reveal ownership or not. And ignoring requires intentionally lying. Christianity supposedly advocates against lying, and we repeatedly see Christians ignoring their own religion in order to supposedly “prove” it. Not exactly a great way to do that. You’ve somewhat let the cat out of the bag before the Christian has taken responsibility for his posts, indeed if he chooses to. He knows these two posts exist. But has pointed out that I failed to completely redact his contact info from the transcript. I have done so now and apologize. Oops, sorry. You can edit my comment if you like. No problem. I would like to stand and be counted as guilty, as well. In this case am also guilty as charged. Val, what I find to be amusing about all the christian apologists or rather all religious apologists is they claim the existence of their god is so obvious and then go into great lengths to come up with arguments to prove such an existence. I don’t know, maybe I haven’t researched, are there arguments for the existence of the sun? Are there asunnists out there somewhere? Why would an omni-god require more than one argument as proof of its existence. All the people who argue for the beginning of the universe must show a few things, at what point was matter created? Does the person making the claim hold that matter can be created or destroyed? And if the claim is that their god created the universe, taking the universe as an effect, what caused their god to do so? Was he alone in god space and time and then out of nowhere, he received an epiphany that he could create a universe? I would love responses to some of these questions. excellent observation. I hadn’t really thought about how ridiculous it is that theists must go to such great lengths to invent “reason” after “reason”. As always, the claims that a god’s existence is “obvious” are false. There is a thesis I read sometime ago that even the BB cosmology doesn’t rescue the KCA. For if a divine creator is required, is a divine destroyer required for the destruction of the universe. If the universe, as other stars suffer stellar collapse, a divine creator is irrelevant. What do you have? Just a blog on the internet? Therefore if WLC has no idea what he is talking about, then what does that make you? WLC is a creationist. He is not a young earth creationist, but he still believes that his god created the universe and that creationism aka intelligent design is a likely replacement for evolution. He’s just one more Christian that accepts science when it becomes so obvious they can’t deny it anymore, and picks and chooses what he wants to believe from the bible. His magic decoder ring is on just as tight as every other Christian’s. However, in the sentence you half-copied, I am not saying that WLC is a creationist. I am saying that he uses the same type of arguments that creationists use, keeping themselves ignorant of recent discoveries, etc. Yep, he had an article published in Astrophysics and Space Science. Here it is: http://www.leaderu.com/offices/billcraig/docs/ultimatequestion.html And it from 1999 and does not take into account the most recent research that shows his claims to be wrong. Cornell, you’ve done the same thing that many Christians do, appeal to outdated claims to support your myths. Creationists do this all of the time. The article is again an attempt to defend the Kalam cosmological argument and it fails since it premises require that one believe baseless assumptions are true. It’s complete with special pleading for God being the magical special only thing that does not need a beginning. Christians can’t show it merely exists much less that it doesn’t need a beginning. Also, WLC wants to pretend that the cosmological argument only supports his god. It does not such thing, it can be used for any god if one accepts its baseless premises, which poses a problem for Christianity. If other gods are the “right” one, then Christianity fails and there is no jesus, no salvation, nothing to make Christians special. Here is a rebuttal of WLC’s paper above: http://www.philoonline.org/library/morriston_5_1.htm So, again, the fact that WLC had a paper in a journal doesn’t not mean it is right or that no one can challenge it. WLC does have articles in philosophy journals. That does not mean his claims are true, that he can prove them true or that the other opposing claims in those journals are not true. You seem to be attempting to appeal to authority. Why yes, I do have a blog on the internet. Did I claim that since I did, that means I’m right? Why no, I didn’t. I also have facts on my side, not philosophical claims that have nothing supporting them. The fact that WLC has no idea what he is talking about has no impact on the fact that I do know what I am talking about and can support it. If you don’t think I know what I am talking about, please do cite the parts that you are claiming and why you don’t think I know what I am talking about. Please educate yourself on what your opponents hold to, unless you are one of those people who love attacking strawmen. The point is that if one is going to critique another person’s view they have an intellectual duty [if they wish to be taken seriously – and it’s quite possible you do not want to be taken seriously] to get their view correct in their representation of it. Why don’t you list me an example of Craig picking and choosing what to believe from the Bible instead of just asserting the claim that Craig picks and chooses what to believe from the Bible? Are you capable of doing this, or do you live by the old “Because I said so, therefore it must be” village atheist mentality that I see all the time from ignorant atheists who desperately need to invest in logic and argumentation 101 books. Doesn’t matter now, because you just said this “WLC is a creationist” So I guess the old saying: “If it looks like a spade it’s a spade” worked out for me here. Thanks for pointing out the obvious, as that was the same article I posted on your page. Wow you are ignorant on this subject, no wonder why you are so cocky about everything, it’s because you are one of those people who probably puts her fingers in her ears every time someone who disagrees with her offers an argument that she doesn’t like. If you are NOT implying that scientific PROOF exists, then you can just ignore that, though my response would simply be….So what? Do all scientists agree on this up to date work that supposedly poses a problem for the Kalam? Last time I checked, there are many Non-theistic scientists who hold to different views on the nature of reality. So which scientist of yours is most likely to be right? Ummm no it’s not, it’s only special pleading if God was defined as a being who came into existence. That’s what special pleading entails, you’d learn about that in an introductory book to logic. I’ll go over this with you later on. One doesn’t have to go that route, one can simply just use the KCA to come to the conclusion that ‘The universe has a cause” and move on with their cumulative case. Well I don’t know if you’re aware of this, but the KCA is an argument for a GOD OF MONOTHEISM, not a GOD OF ONE SPECIFIC RELIGION. So, you are indeed ignorant of what your opponents argue for, hence you just want them to say what you want them to say, instead of reading what they actually say, because it makes you feel comfortable attacking strawmen. IMO you need to pick the straw out of your teeth. I never said he couldn’t be challenged so this is a strawman on your part. Lastly, WLC has replied to him in other scholarly articles. ^maybe you should try taking your own advice and keep up to date with the work of your opponents…. Do you see the part where I say “not saying this proves God exists” or are you purposely lying for naturedidit? Anyways this is a strawman on your part. I heard reading comprehension was hard, can I get a confirm or deny? What I did claim is that your objection of saying WLC doesn’t know what he’s talking about is way too radical and I don’t think that academia will publish works from people who don’t know what they are talking about. It appears that you are just arguing from EMOTION rather than REASON. Maybe he is wrong, maybe he is right, but he argues with claims good enough to be published in academia. So I think anyone who isn’t overly biased and has a sane mind will admit that he at least has SOME idea on what he is talking about. Your claim is just too radical, and this is something I’d expect from someone who is ignorant of academia. In fact my friend Nick Peters just took you to school on your (Juries, sources and what the gospels has to say about 500 witnsses among other things (aka Postzilla part 1) post. You are extremely ignorant of how academia goes, and this is quite ironic. Person A accepts standard(s) S and applies them to others in circumtance(s) C.
WLC never states that God has the property of having a beginning, so there is no special pleading taking place, it’s more like your ignorance of logic. Whoa so this was the lions den? ……so Scary….Oh man I’m shaking, I’m shaking… I think I’m going to ditch Theism and just say NATUREDIDIT from now on, because of this horrifying experience I had here that shook my beliefs. You are lying again, Cornell. WLC is a creationist. You can hear his own words right here: http://www.youtube.com/watch?v=cSc92EDm5gU He says he’s between “progressive creationism” and theistic evolution. Theistic evolution is the assumption that God created the world and then let evolution work. It is still creationism. So you have failed. The Discovery Institute also is lying. I am located in central Pennsylvania where the Dover case was, and it was such a pleasure to watch creationists being caught with their figurative pants down. The creationists at Dover tried to use Of Pandas and People as their text book. And I do have to say I love that book since it shows that creationists are those behind intelligent design. Judge Jones was shown the evidence that the book once upon a time said creationists rather than ID. Let’s look at the evidence. “”Creation means that the various forms of life began abruptly through the agency of an intelligent creator with their distinctive features already intact. Fish with fins and scales, birds with feathers, beaks, and wings, etc.” and then it was magically changed to “”Intelligent design means that various forms of life began abruptly through an intelligent agency, with their distinctive features already intact. Fish with fins and scales, birds with feathers, beaks, wings, etc.” In drafts of the book, it’s even more silly. One draft of the book said “The basic metabolic pathways (reaction chains) of nearly all organisms are the same. Is this because of descent from a common ancestor, or because only these pathways (and their variations) can sustain life? Evolutionists think the former is correct, creationists accept the latter view.” And Then it was changed to “The basic metabolic pathways (reaction chains) of nearly all organisms are the same. Is this because of descent from a common ancestor, or because only these pathways (and their variations) can sustain life? Evolutionists think the former is correct, cdesign proponentsists accept the latter view.” See that lovely “cdesign propentists”? That’s what happens when the search and replace function works better than one would hope and shows that creationists are liars. They tried to replace creationist with “design proponent” and they were nicely hoist on their own petard. And we also have that lovely thing that also shows TrueChristian creationists as liars when they claim falsely that ID isn’t creationism. It’s called the Wedge Document, created by the Discovery Institute and admitted by them to be theirs. I do like this part of it “Discovery Institutes’s Center for the Renewal of Science and Culture seeks nothing less than the overthrow of materialism and its cultural legacies. Bringing together leading scholars from the natural sciences and those from the humanities and social sciences, the Center explores how new developments in biology, physics and cognitive science raise serious doubts about scientific materialism and have re-opened the case for a broadly theistic understanding of nature. The Center awards fellowships for original research, holds conferences, and briefs policymakers about the opportunities for life after materialism.” Yep, they want a theistic understanding of nature. We see no mentions of aliens or other creatures responsible for creation, it’s god all the way from a Christian group of people. So again, we see that the words of the very people you cite about ID are liars. Your citing a poll is hilarious. Sorry, a bunch of opinions does not change the fact that ID is creationism. You are using a rather bad example of the appeal to popularity. Golly lots of people think that something is true so it simply must be. Nope, doesn’t work that way, Cornell. You wish evidence that WLC picks and chooses what he wants from science and the bible. Well, that video has it in spades. Poor WLC, he doesn’t want to make creationists mad, so he tries to have his cake and eat it too. It might be evolution but WLC doesn’t want to actually say that, and that would make Genesis one big piece of nonsense. WLC wants to claim that the big bang supports his kalam cosmological argument. However, this means he must ignore any scientific work after say about 1980, work that shows that there does not need to be a beginning to the universe. WLC really likes the Borde-Guth-Vilenkin hypothesis, but poor WLC one of the authors, Vilenkin, said himself that WLC was lying about the paper and the conclusions. As for the bible, well Willie says this “God has not abandoned us to work out by our own ingenuity and cleverness whether or not He exists. Rather His Holy Spirit speaks to the heart of every man, convicting him of sin and drawing him to God.” However this isn’t true per the bible, where JC himself says that some people are intentionally kept from understanding his/god’s words and are damned (Matthew 13, and repeated again in Romans 9). WLC ‘s claim of “every man” isn’t true, only a invention by modern Christians so their god isn’t quite so distasteful. Cornell, I posted the link to the WLC article, something you were too lazy to do. And aw, nice insults there, Cornell. Sorry, no I am not ignorant on this topic. But please do keep trying to tell falsehoods about me. The philosophical arguments in the KCA are based on unproven premises. In logic, the arguments are only true if the premises can be shown to be true. Since we cannot prove that the universe must have had a beginning, the KCA has nothing to back it up. For all of your touting your great knowledge of logic, you’ve failed quite amusingly in this one bit. Oh and you use Popper too. Sorry, one more philosopher doesn’t impress me since he can’t show his arguments to be true either. I love that bit that we have no “knowledge”. It’s just a riot to read when Christian like you don’t actually believe that at all. You do not live like this is true, happily enjoying the facts of science when it makes you all comfy. No, you only doubt such things when it shows your myths to be false. Alas, Cornell, even if we don’t know everything about everything, that still doesn’t mean your god exists. And wow, that’s a hilarious claim about special pleading. No, Cornell, it is not “Ummm no it’s not, it’s only special pleading if God was defined as a being who came into existence. That’s what special pleading entails, you’d learn about that in an introductory book to logic. I’ll go over this with you later on.” Oh my. Special pleading is when you want a premise to apply to everything except to a special consideration of yours. You need the exception to allow your claim to stand. The kalam argument depends on special pleading since you want everything to have a beginning and a creator *except* your god. You want a special exception to the claim “everything must have a beginning and a creator” to make the argument “god created the universe” to work. This is what WLC has claimed ““Now from the very nature of the case, as the cause of space and time, this supernatural cause must be an uncaused, changeless, timeless, and immaterial being which created the universe. It must be uncaused because there cannot be an infinite regress of causes.” It is the fact that he says that this god is uncaused and everything else is caused that makes this special pleading since there is no reason for saying God is uncaused. WLC cannot show that there cannot be an infinite regress of causes. I have read works on logic and that’s why I know why your claims and WLCs fail. No valid premise, no valid answer. So, until you can prove that the universe must have had a beginning, the KCA fails. I’m waiting. Nice lies again, Cornell. I have not said nature did it without thought as you seem to wish I did. There is evidence for natural processes. There is no evidence for your god or your claims. I have said we do not know some of the answers and that does not mean that god did anything. SO wait a minute, he is between an view that creationists take and a view that evolutionists (Francis Collins) take, therefore there is no 50/50 here and he is indeed a 100% creationist? Was my failure a 50% failure? I don’t see how 50/50 automatically jumps to one side, you are just being biased and that bias is overtaking your reason. Notice how I don’t have any burden here either, because it was YOU who made the claim that he is in fact a creationist. I challenged this and now it seems as though you think 50/50 is enough to put a label on someone. So what was that again about this? That’s strange, so what do we make of ID advocate David Berlinkski who is neither a Christian, nor a Theist? Is it more a matter of me lying? Or are you just an ignoramus when it comes to these topics? Now I would love to engage on your other garbage, but before I do so I’d like to see if you can actually admit to being wrong here. Otherwise I don’t really see any point of debating with you, hence you take too much of a ‘I know everything when it comes to debating Theists who disagree with me” attitude, and well….this would just be an exercise in futility. I’ve just exposed your ignorance 3 times now, and I’m starting to feel sorry for you. And hopefully you’ll also respond to my friend Nick Peters criticism that is on his blog Deeperwaters. Oh Cornell, you’re just too funny. And you are such a great example of how Christianity makes no one a better person. WLC is between two creationist views, progressive creationism and theistic evolution. Now, since those things are the same set, creationism, then WLC is a creationist! You keep digging yourself in deeper and deeper. I do enjoy that. You still are racking up a 100% failure. You see, Cornell, if you’d look up what theistic evolution is, it still has God creating things, the first organisms, the world, the universe. So, tah-dah, WLC is a creationist and you are a Christian who can’t admit he’s wrong. Theistic evolution does not accept that critters came from “non-living” matter, abiogenesis. That’s the difference. Evolution and abiogensis are totally different things, but unfortunately, creationists do their best to conflate them to support their false claims. Why, yes, the Discovery Institute is lying and Judge Jones saw that. And nice try to claim that I find anyone who disagrees with me to be a liar, but that’s just another sad little strawman argument. I do not. I request that either you apologize for that a claim or support it with evidence. I don’t much care what Michael Behe holds to. He is a creationist and it’s always just hilarious to watch Christians disavow what they claim to believe in. Now, if you don’t believe me, I would say ask Behe who he believes this “designer” is. Now, I can guarantee he won’t say aliens or other gods, he’ll say it was the Christian god. However, he does his best not to ever answer that question, because if he did, then his claims could be tested. Like WLC, he is an old-earth creationist, who accepts a billions year old earth, and a type of evolution but not the evolutionary theory we have today that has that there is no divine interference. “Although Darwin’s mechanism – natural selection working on variation – might explain many things, however, I do not believe it explains molecular life. I also do not think it surprising that the new science of the very small might change the way we view the less small.” Behe, Darwin’s Black Box. Again, we see that some Christians accept that which reality has shown to be valid. They are of course heretics to their fellows who still think that the earth is 6000+ years old and that animals appear wholesale. They of course have no more evidence for their claims or their god than the next. This is from the Judge’s decision: “Consider, to illustrate, that Professor Behe remarkably and unmistakably claims that the plausibility of the argument for ID depends upon the extent to which one believes in the existence of God. (P-718 at 705) (emphasis added). As no evidence in the record indicates that any other scientific proposition’s validity rests on belief in God, nor is the Court aware of any such scientific propositions, Professor Behe’s assertion constitutes substantial evidence that in his view, as is commensurate with other prominent ID leaders, ID is a religious and not a scientific proposition.” – http://www.talkorigins.org/faqs/dover/kitzmiller_v_dover_decision.html I would say also, that it is very interesting to read the transcript with Behe on the stand: http://www.talkorigins.org/faqs/dover/kitzmiller_v_dover.html Days 11 and 12. It shows that Behe is found to have misrepresented himself numerous times when it comes to his contributions to Of Pandas and People. It’s always interesting when someone is claimed to be a critical reviewer and author, but then tries to deny it. You ask me “Cdesign proponentists” accept what?” Well, if we read the paragraph it shows that cdesign propentists aka creationists aka intelligent design proponents accept that only these pathways can sustain life. Behe claims to have critically reviewed this book and signed off on it aka he agreed with what it said. He has claimed to be a major researcher for ID and in this he said that ID proponents accept that there are no common ancestors. Now, he seems to want to change his tune. No surprise there. As what to make of David Berlinski? I’m not sure what to make of him, though he’s not very smart if he accepts the Wedge Document written by the very organization that he is a “senior fellow” of. He claims to be a “jewish agnostic” that disagrees with evolutionary theory. He is also a philosopher and seems a mathematician. The closest he has gotten to biology, physics, is being a research assistant in molecular biology. He refuses to give an opinion on what should replace evolutionary theory, but is sure that it is wrong because various reasons, one being that there are no transitional fossils (which is a rather sad lie, since there are quite a few: http://www.talkorigins.org/faqs/faq-transitional.html for just a few of the vertebrate fossils) and he does the lovely little bit where he tries to claim that “Darwinism” created the Nazis. So, it seems that David Berlinski is an agnostic who also indulges in spreading false claims and keeping himself ignorant of anything that shows him to be wrong. Agnostics and atheists and well as Christians can have the same problems, trying to make claims with no evidence. This poor fellow seems starved for attention. It’s not a matter of your lying necessarily, it is a matter of your willful ignorance. You sure do want me to admit I’m wrong even when I’m not and you cannot demonstrate it, but can’t do so yourself. A pity, that. And I see you simply couldn’t actually stick to not waiting until I did your bidding and admitted I was wrong. Again, I do love when someone like you has to declare that they’ve “won” because no one else would think so. You’ve exposed nothing here, dear, except yourself. And please don’t feel sorry for me. There is really *nothing* to feel sorry about. And you are the perfect example of why internet atheists are an embarrassment to atheists in academia. OK, you have no idea what evolution entails. You actually put your foot in your mouth when you brought up abiogenesis, hence Evolution doesn’t speak on whether or not a creator exists, and this is why we see Theists who hold to Darwinism. An evolutionist is a person who accepts evolution, so it doesn’t matter whether or not they hold to Theism. Just ask the President of the National Institutes of Health in Francis Collins who happens to be a Christian Theist if he is in fact a creationist. Collins has hundreds of scholarly articles in academia , just plug his name into the pubmed database, so I think his view on things is much more credible than yours. Or ask Theist Ken Miller who argues against creationists. Or Theist Simon Conway Norris who comes from Cambridge, or Philosopher Richard Swinburne who taught at Oxford for many years. 1.Evolution: the process of change and diversification of living things over time. 2.Evolutionary history: the reconstruction of the universal tree of life (common ancestry). 3.“Darwinism”: the mechanism behind evolutionary change is natural selection operating on random variations in living things. This makes it clear just where ID advocates and Ayala go there separate ways. It is not on evolution or even common ancestry but on *Darwinism. * So the word ‘evolutionist’ becomes a bit difficult to define, this doesn’t pose a problem for me though since you are the one making the claim that WLC is a creationist. Though it doesn’t matter anyways, because Craig is also a Theistic evolutionist. So ID is incompatible with creationism and Theistic evolution is most certainly incompatible with creationism. Well this is just you putting your fingers in your ears when someone demonstrates the fact that you are incorrect about something. I’ve just shown that Behe holds to common decent when just before you stated ID advocates did not hold to it. Therefore your claim was just shown to be egregiously false. It’s not my fault you can’t deal with being wrong. Who cares who he believes the designer to be, hence I just showed you before how evolution doesn’t speak on whether or not a God exists and how a Theist can hold to Darwinism. Well we aren’t talking about whether or not ID is valid, we are arguing about whether or not ID is the same thing as creationism, and that is clearly not the case. You are just making up your own definitions that are not supported by reality. It also makes absolutely no sense on why ID advocates like David Berlinski hold to ID, given the fact that he isn’t even a Theist. So I’ve demonstrated that ID does not NECESSARILY entail a belief in God, and therefore ID is incompatible with Creationism, hence creationism NECESSAILY entails a belief in God. So your claim is palpably false. Instead of making a bare assertion why don’t you cite the source in which he denies common ancestry. And it doesn’t matter if he did change his tune anyways, hence at one time he was an ID advocate that supported common ancestry, so this just goes to show that one doesn’t necessarily need to reject common ancestry whilst holding to ID. So your argument fails either way. So once you say ‘David berlinkski is an agnostic’ you’ve conceded the debate. It doesn’t matter how smart the Princeton alumni is, or whether or not he is right, what does matter is the fact that David Berlinksi is not a Theist and does hold to ID. This means that I’m right and you’re wrong. You do remember what we were actually arguing about, right? I’ve just demonstrated it with Berlinksi, he basically ends this discussion. Perhaps next time you will not be so sloppy. That’s all I needed to show from my end, and your double talk just did you in. THEREFORE you just contradicted yourself and was shown to be WRONG. You should try to be humble and admit to being wrong about something. Ok let me try posting this again, this time without the links. You can disregard my old comment that’s awaiting in moderation. Please do show where anyone thinks I’m an “embarassment” to atheists in “academia”. Or is this just wishful thinking, Cornell, more lies and appeals to authority? Tsk. Oh and a lie that claims that I have no idea what “evolution entails”. Alas, you are very wrong. You’re right, evolutionary theory doesn’t mention a creator or not. That’s why a creationist (that which believes in a creator of the universe) can accept it. Let me let you in on a secret, Cornell, evolutionary theory isn’t just Charles Darwin, we’ve gone whole lot further than that in these 200+ years after his death. Theist evolution says that there is a creator and that this creator uses evolution. See, the word “creator”. Anyone who believes in one is a creationist. There are many different kinds of creationist, and they all are very entertaining in insisting that those “other creationists” are wrong, of course without any evidence. Francis Collins is a creationist and the number of his articles has what to do with him being a creationist? Such a lovely appeal to authority. The Wiki article on theist evolution says “Theistic evolution, theistic evolutionism or evolutionary creationism is the view that religious teachings about God are compatible with modern scientific understanding about biological evolution. Theistic evolution is not a scientific theory, but a range of views about how the science of evolution relates to religious beliefs.” Answers In Genesis has that progressive creationism and theistic evolution are wrong . If all of the “authorities” you’ve mentioned believe that a god created the universe, then they are creationists. Creationism is not incompatible with ID. But since you said you can show how it is incompatible, then go to it. I’m waiting. I have no idea what you were trying to do in the bit about Franciso Ayala. The sentences are not complete and you for some reason want to make a distinction between “darwinism” and evolutionary theory. It’s amusing but you’ve nothing but state the same thing twice and evidently think it’s two different things. Mechanism and process is essentially the same thing. Intelligent Design is the claim that there was an intelligent designer of the universe. Creationism claims that there was an intelligent designer to the universe, and it was a specific one, some god. So they aren’t incompatible, one has a specific designer, and the other has that any god, or any alien or any other force could be the designer, as long as it is intellligent. Sorry, you’ve failed to show that ID is incompatible with creationism. Cornell, there is nothing that says that the intelligent designer couldn’t use evolution as part of its design. We can call WLC a creationist since he is one. A strawman argument is a false claim that is created by the opponent to be attacked. You wish to claim I find anyone who disagrees with me to be a liar. That is the strawman, that I am unreasonable. Since I am not, you have created that false version of me to attack since you cannot successfully attack the real me. You did not show that I was wrong by using Michael Behe, and I showed why, after I said I didn’t care much about what Behe holds too. Nice omission there, Cornell. No problem, I’m quite use to your antics and your lies. Please do keep going. Behe holds to common descent and he is an old-earth creationist. One does not preclude the other. Sigh. I do love how you say “who cares who he believes the designer to be?” Oh golly, I don’t know, because that would show him to be a Christian creationist? Creationism doesn’t not only concern itself with there being evolution or not. Theistic evolution says that there is a god that created everything and that it started evolution as its plan. Young earth creationism says that a god poofed fully formed animals as we see them today into existence. Old earth creationism can go with theistic evolution or some variant, like where some Christians claim that this god interfered with protohumans and put a “soul” into them, or that some living things were poofed and some weren’t. ID is not valid since it is creationism and thus has no evidence to support it in any of its forms. People like David Berlinski hold to ID for many reasons. Berlinski has admitted he is a crank, someone who professes to believe something that has no evidence showing that it is true, much like someone who disbelieves the moon landings happened. I know that ID does not necessarily entail a belief in a god, but it *CAN* entail a belief in gods and thus it is compatible with creationism. Just because it could entail belief in aliens does not preclude that it *also* can entail a belief in gods. ID only claims a intelligent designer, it does not say is must be one kind or another and your “therefore ID is incompatible with creationism, hence creationism necessarily entails a belief in God” is false. I did show where Behe screwed up. It’s the testimony and judge’s decision that I listed. I am glad that you didn’t take the time to read them. Keep using “hence”, it makes me smile every time you try to show cause and effect and fail. Please do show how by confirming that Berlinski says he’s an agnostic means I’ve “conceded the debate”. I don’t see it and I think you’re just hoping someone agrees with you. Agnostics, atheists, theists and whatever can be wrong, and there is no reason to think they are right with no evidence. Golly, and I do love when a Christian says the discussion is ended by declaring something and not supporting it. I mean, really, do you know what an agnostic is? Tsk. An agnostic can want a theistic understanding. They haven’t made their minds up yet. This discussion is becoming an exercise in futility. You constantly refuse to admit that you’re wrong with respect to your layman terminology that I only see radical anti-theists and ignorant layman on the internet defending, so lets look at your link on Theistic evolution, because it obviously works against you, and I think that you should have read it a little more. “The term was used by National Center for Science Education executive director Eugenie Scott to refer to the part of the overall spectrum of beliefs about creation and evolution holding the theological view that God creates through evolution. It covers a wide range of beliefs about the extent of any intervention by God, with some approaching deism in rejecting continued intervention. Others see intervention at critical intervals in history in a way consistent with scientific explanations of speciation, but with similarities to the ideas of Progressive Creationism that God created “kinds” of animals sequentially. Notice the part where Eugenie Scott herself states that ‘IT IS A TYPE OF EVOLUTION RATHER THAN CREATIONISM”?????? You also insult scientists who hold to Theistic evolution and actually work in the field of biology that go by the names of Kenneth Miller (who wrote a criticism of ID in “Finding Darwin’s God’) Francis Collins a man who was only handpicked by Obama himself to be the president of the National Institutes of Health, and Simon Conway Morris who is a from Cambridge just to name a few. Why are they wrong, but yet you are right? Well hopefully you’ll finally concede and admit to being wrong. Now let me elaborate on this point a bit more. You fail to understand the fact that the debate ultimately lies between ‘evolution’ and ‘creationism” so all you are doing here with your layman terms is equivocating the terms ‘Theism’ with ‘Creationism’ as meaning the same exact thing, and this is a common mistake that I see from ignorant laymen who are unfamiliar with how things go in academia (see Eugenie Scott above), HENCE you like to stay comfortable living with pop-internet anti-academia culture where virtually anyone can sound persuasive to gullible people that are ignorant of what goes on in the scholarly realm. Here is another reason on why academics don’t use the terms Theism and Creationism as being the exact same thing. Because if we use your term of ‘creationist’ then the word ‘creationist’ becomes too vague. There is a much better term for grouping up Theistic evolutionists, ID advocates who are Theists, Old Earth Creationism, and Young Earth Creationists into one bowl, this term is THEISM, not creationism. This term has been working just fine for thousands of years. You won’t find many, who refer to Francis Collins as a creationist, and this is because he is an EVOLUTIONIST just like myself. Why? Because the debate only has two dogs in the fight, and that is evolution and creation, not evolution and Theism. The David Berlinkski point was to counter your nonsense about ID advocates promoting Christianity and only Christianity (remember the quote I posted of yours?) I noticed that you tried to be disingenuous here and move the goalpost on that point, but unfortunately for you I’m aware of the nonsense that people such as yourself try to pull on Theists, so I’m not going to let you get away with that one. That was what I meant when I said you CONCEDED, so why not admit now that you did? Lying about it only makes things worse, so unless you have a problem with reading comprehension the facts are here on this page for everyone else to see. Then I posted a quote from Behe and now all of a sudden you want to brush it off and admit that they do hold to common decent. How exactly is this compatible with your definition of creationism? How could it be possible for metaphysical naturalism to be true along with ID, but yet ID still being compatible with creationism? Please enlighten me on how this makes any sense? Oh and why are you evading my friend Nick from Deeper waters? He wrote you a blog post that heavily criticized your 500 post and I notice that you don’t want to return the favor, but yet expect to him to come here to debate you. BIAS MUCH? Do you need the advantage of your own blog? hmmmm well why not do what he did take the neutral route? Or are you just going to concede all of his criticisms, because he isn’t a Bible-Belt fundy that holds to fluffy bunny Christianity and you can’t handle non-fundy Christians? Or are you going show some dignity and write up rebuttal on your blog about his reply and point out his errors? Lastly why didn’t you admit to being wrong when I called you out here? I know it really disappoints you that you can’t get your way by pretending I’m wrong and demanding that I admit it, but that’s just too bad. You see, I don’t admit I’m wrong if I am not. And yes, it is indeed an exercise in futility on your part to keep that up. We even have you lying more and more with your claims that I am somehow an “ignorant layman” if I don’t agree with you. Please do keep on with that. I’ve rarely had such a great example of a Christian here. The theistic evolution article on Wikipedia has that theistic evolution is part of creationism. It is is the belief that there is a god and that it created the universe, and then used some version of evolution to explain the fossil record and the diversification of animals. It does this because literal creationism is simply silly and has no evidence at all to support it. There is a spectrum of between literal creationism (aka god poofed the universe and everything else into existence in 7 24-hr periods) and evolutionary theory, which does not require a supernatural force (it doesn’t even mention a god at all). We have seen Christians move along it, from deciding that the “days” couldn’t be just 24 hours, to “kinds” of animals, to accepting “microevolution”, to the essentially Deist idea that there was a “god” and it started everything and left. All of the Christians are certain that their version is the best answer, but they all require a creator. They have changed as science has discovered better and better evidence for evolutionary theory and has found nothing that supports the nonsense in Genesis. Why yes, I do note what Ms. Scott says. In the first paragraph you cut and pasted, Ms. Scott used the term “theistic evolution” to refer to the part of the spectrum between literal creationism and evolutionary theory. Hmmm, it also says that “it” (theistic evolution) covers a wide range of belief about the extent of any intervention by God. You see it says extent, it does not question if God is the creator, that is assumed. We still need a creator and thus, creationism. Ms. Scott may divide the spectrum how she likes and she may consider TE more evolution based than creationist based. I disagree, and Ms. Scott’s position of ED for the NCSE doesn’t impact what I think. Now, I do wonder if you read the words of the Evolutionary Creationist Denis Lamoureaux, who was quoted “”The most important word in the term evolutionary creation is the noun “creation.” These Christian evolutionists are first and foremost thoroughly committed and unapologetic creationists. They believe that the world is a creation that is absolutely dependent for every instant of its existence on the will and grace of the Creator. The qualifying word in this category is the adjective “evolutionary,” indicating simply the method through which the Lord made the cosmos and living organisms. This view of origins is often referred to as “theistic evolution.” However, such a word arrangement places the process of evolution as the primary term, and makes the Creator secondary as merely a qualifying adjective.” It’s the same exact idea, it’s just different terms used to describe it. If the acceptance of God creating the world and then using evolution to form it is evolutionary creationism, like Mr. Lamoureaux says, and that definition is also used for theistic evolution, they are the same thing. It’s just the Christians emphasizing one word and Ms. Scott emphasizing another. Miller says that his version is right, that God is using evolution to get to those structures, organs, biochemical pathways, etc. That this is what God intended. So, if we have a desired result and a method was used to get it, like a potter using a wheel vs slab construction, we have a creator who had a design that was arrived at by evolution and thus evolutionary creationism or theistic evolution; both of which are forms of intelligent design since we need an intelligent designer. Miller seems to narrowly define ID to suit himself and not fall under its aegis. As soon as they can show evidence for their god, they can show that they are right. As it is, they are offering baseless opinions and are no better than me. As for Collins, one more scientist who really really wants a god but knows how silly literal creationism is. Here’s a good quote from him to show he does indeed believe in an intelligent designer: “If, however, the universe is actually the product of a rational Mind and evolution is simply the search engine that in leading to sentience and consciousness allows us to discover the fundamental architecture of the universe – a point many mathematicians intuitively sense when they speak of the unreasonable effectiveness of mathematics – then things not only start to make much better sense, but they are also much more interesting. Farewell bleak nihilism; the cold assurances that all is meaningless. Of course, Darwin told us how to get there and by what mechanism, but neither why it is in the first place, nor how on earth we actually understand it.” http://www.theguardian.com/global/2009/feb/12/simon-conway-morris-darwin Poor ol’ Conway Morris also is a liar when he does try to claim that atheism equals nihilism. I have plenty of meaning in my life and have no need of a sky fairy telling me all I am ever intended to do is worship him or be damned. What a pitiful life, but the fear of death does make humans do silly things. Creationism requires theism, cornell. And I do l love how you are an expert on “how things go in academia”. You have yet to show that at all. Nice appeal to authority though. Nice lies too. Alas, I am not comfortable with the ooh terribly scary “pop-internet anti-academia culture”. Indeed, what the heck is that? Just those who disagree with poor ol’ Cornell? It seems to be since anyone who doesn’t agree with you, no matter how “scholarly” is somehow anti-academic and wrong. No one is using theist to directly equal creationist. You see those extra words, cornell? Theistic evolution? I do class “theistic evolutionist” as a type of creationist and indeed a type of theist. You are right, using theist to equate creationist is too vague and that’s why I don’t do it. And we use the various terms of creationist, young-earth creationist, etc rather than theist since they all do not agree and all consider their way the only way. So, no you can’t use theist to describe all types of creationist. They dislike each other intensely and enjoy ripping each other apart, each assured that those others aren’t TrueChristians. Which is hilarious to this atheist. I don’t care if I won’t find many who define Collins as a creationist. I don’t agree with everyone and I can show why I don’t. You are a creationist too, or don’t you believe that your god, an intelligent creator, created the universe and created all life by evolution? If you don’t believe he created the universe, etc, then you have a limited god that is not the one that the Bible describes. It’s very telling that the term creationist is so much in bad odor. I can understand why you don’t want to be called one. They are rather embarrassing aren’t they? ID does support Christianity almost entirely. But if you wish to disagree, show me how many people claim that ID has another source than the Christian god. I’m waiting. Please do show where I attempted to move the goalpost. And aw, you decided that I conceded. Oh the wishful thinking and again, no evidence to support how great you are. Please do show where I lied. If you can’t, then tsk. Oh and insults about reading comprehension! How fun! However, since you can show how wrong I am and have to rely on the “but but it’s OBVIOUS” nonsense, I think you again have nothing. Intelligent design, unlike evolutionary theory, is an attempt to put god in biology, cosmology etc. There is no difference between the structure of a cell and the structure of a star, ID and creationism claim that God did it all. Michael Behe is a biologist and wants to put god in his biology, with his claims of irreducible complexity. ID advocates are not one uniform group. Behe claims that the only explanation for various celluar things, etc, is the the mechanisms in them came fully designed, that they could not have come about by evolution. Here is what he says which shows he does indeed agree with common descent but wants to also have intelligent design in “molecular life”: Further, I find the idea of common descent (that all organisms share a common ancestor) fairly convincing, and have no particular reason to doubt it. I greatly respect the work of my colleagues who study the development and behavior of organisms within an evolutionary framework, and I think that evolutionary biologists have contributed enormously to our understanding of the world. Although Darwin’s mechanism – natural selection working on variation – might explain many things, however, I do not believe it explains molecular life. I also do not think it surprising that the new science of the very small might change the way we view the less small.” – Darwin’s Black Box. It’s the typical piecemeal acceptance of some of science and ignoring of other parts as is convenient to the Christian. One can be a ID person and still be a creationist and a old-earth creationist. I am not wrong. You have decided that these terms are mutually excluding and they are not. I very well may be also guilty of too narrowly defining what ID people are and are not. But as my research goes on, like that Behe quote, the tangled terms of ID, creationism and the various forms of creationism, inlcuding theistic evolution, become more tightly linked. The ID movement was not invented by UFOlogists, it was invented by Christians. They tried to change their book from creationists to intelligent design when creationism found disfavor in the courts and it was an intentional deception to get around the law. ID can indeed include aliens, but then what created the aliens? Honestly, cornell, did you think that far? And “metaphysical naturalism”? Please do define that. Knowning what you mean, then I can “enlighten” you. I’m not avoiding poor ol’ Nick at all. I’m right here. Please tell me how that is avoiding him. Poor Nick,again only has wannabee minions touting how great his post is and he can’t come here at all. But as I’ve noted, his post is nothing new. Yep, read it, yep,not impressed. If he thinks he has something great, then he can invite me himself. Yep, I expect someone who claims to have refuted me to at least tell me he thinks he’s done so in the comments of the post and offer me a link to come to. It’s hilarious to watch you and potatoe and others do their best to get external validation from me. I’m flattered, but one more Christian post that covers the exact same things that other Christians have doesn’t impress me. And “neutral route”? posting on his own blog and hiding? Please tell me how I have any advantage here. I allow any post through that isn’t spam. So, no advantage there. And nope, not conceding anything, but it’s awful sweet to see you again declaring you’ve won and no evidence for that either. How expected. Poor ol’ Nick and you are fundamentalists just like any fundamentalists. You pick and choose what parts of the bible are true and what aren’t. You just pick different pieces. His errors have long been noted. Sorry, still no admission of being wrong when I’m not. Go pray some more, cornell, It’ll be just as effective as you insisting I’m wrong and insisting I admit it. It is amusing to see a bully realize the limitations of the internet for his attempted actions. Please, cornell, you are trying to claim that WLC’s appearance in philosophy journals should be considered as evidence for his claims. I’ve been down this road before, the Christian, caught in his silliness now wants to claim that he did not “exactly” say something he meant. Yes, many Christians say “well, I’m not saying that this proves god exists” and they always have an implicit “but” since of course they are since they are believers. “not saying that this proves God however (aka but) for a guy that doesn’t know what he’s talking about I’d say it’s pretty impressive”. You are trying to imply that I should be impressed. I’m not and for reasons I have detailed. But go on, keep fussing. And if you wish, show how I am “lying for naturedidit”. Surely you can, right? Oh and show me how it is a strawman. Again, you can, right? And QED? That Which was to be demonstrated? Really? You seem to think that similarities are enough to make your case, but you are not factoring in the MAJOR differences with respect to biology. explain these “major differences with respect to biology”. I’ll be waiting. I’ll get to other posts later. I supposed that theism if it did not have a creator god would not be directly equal to creationism. Care to give examples of religions like this? I’m sure you’re aware of the fine-tuning argument, yes? There are many forms, but all of them that are argued in academia only deal with cosmology. These are design arguments, that happen to be teleological arguments. Some people use Bayesian lines of probability calculus in their defense. The fine-tuning argument focuses on the universe as a whole, not just changes in the inherited characteristics of biological populations over successive generations. I don’t understand how this follows, but religion isn’t a necessary attribute that goes along with Theism. One could just be a Deist and believe in a God, but yet deny religion. One could also be a philosophical Theist and believe in a God, but yet deny religion. Anyways, the term creationist in the realm of biology is a concept that implies being an opponent to evolution. So you and I are evolutionists, but we have different views on cosmology. Cornell, religion is essentially theism: Religion: a personal set or institutionalized system of religious (relating to or manifesting faithful devotion to an acknowledged ultimate reality or deity) attitudes, beliefs, and practices and Theism: belief in the existence of a god or gods; specifically : belief in the existence of one God viewed as the creative source of the human race and the world who transcends yet is immanent in the world. (both from Merriam-Webster). I know that many Christians are scared of the word religion since it has such a bad odor thanks to those who practice religion/theism. You need to show me a religion aka a system of theism, that doesn’t have a creator god for religion not to be directly equal to creationism. If someone believes that their god created the universe then they are a creationist, they believe that a god created the universe, not physical laws. Let’s look at what some Christian creationists (old earth type) say: “Theistic Evolution is the old earth creationist belief that God used the process of evolution to create life on earth.” http://www.oldearth.org/theistic_evolution.htm (they used to be known as Answers in Creation). And ah, “fine-tuning”. That’s always a great one. Fine-tuning, the claim that the earth/universe was made just for us, is of course unsupportable since it is a lovely argument entirely based on presupposition. We fit this earth well enough because we evolved to fit it, there is no evidence that it was made *for* us. Indeed, we can’t live on more than 3/4 of it since we do not breath water, we cannot breath above a certain height, we also cannot survive without water in sufficient amounts, nor can we live underground where it is very hot. However, bacteria have no problems so your claims of fine-tuning only work if you have a god that is only concerned with bacteria. The rest of the universe is also not conducive to humans, with stars so powerful and unsteady that they evaporate their planets, shoot beams of radiation that would exterminate humans if we were close by, etc. And using probability calculus is always amusing. Creationism hiding under the skirts of science again. it’s just the old “tornado in a junkyard” nonsense. Creationists often claim that there is such a low probability of life coming about by “random chance” that it couldn’t have happened at all. The problem is that “random chance” is not involved. The laws of physics and chemistry exist and this is not a Seussian universe where things happen randomly. You may want to read this essay about probability calculus and what the originator of it really said: http://www.talkorigins.org/faqs/abioprob/borelfaq.html It is not what creationists claim, as usual. So you’re discrediting Gallop polls now? This is a first, even amongst biased atheists. Wow, so I guess we should be skeptical of every poll they take, right? Do you even understand how Gallop poll works? Do THEY also have no idea what they are talking about or should we have some lady on a blog who has a problem agreeing with people who think differently than her do the polling for us? I’m sure you’ll be real fair! Do you have a source for this situation where Vilenkin calls Craig out on lying, or am I just supposed to take your word for it? So Willie is correct? Is Willie a Bible Scholar, if not then what are his credentials? Are you aware that WLC has published articles in theology journals, so HE IS an authority on this subject. Or do you just discredit WLC outright, because he holds to a position that you disagree with? Anywyas let’s see how good of a Bible scholar you are here, first off should we take Matthew 13 and Romans 9 in a wooden literalist sense? Secondly Popper was arguing about SCIENce not LOGIC. He was arguing against an extreme view of scientific realism. Popper wasn’t saying that we have no knowledge. He was saying that science can never PROVE anything being reasonable doubt, this is why you’d notice that scientific theories change upon further discoveries, so we can’t say with 100% in 2013 that everything we THINK we know is in fact true with respect to the nature of reality. You seriously need to educate yourself in the field of philosophy of science, logic and epistemology. Also science has no say on whether or not my myths are false with respect to Theism, because God is a philosophical question, not a scientific question. You’d learn this in a philosophy of religion 101 class. Obviously even a Theist who holds to Platonism could say that logic never had a beginning, or that numbers never had a beginning. So there is no reason to even consider the case that special pleading has occured here. ASking for what caused the uncaused cause is like saying “what is the name of married bachelors wife” The definition you apply to God is incoherent. You are basically asking what causes the uncaused cause…. Define God, what do you mean when YOU say God? “WLC cannot show that there cannot be an infinite regress of causes. Whoa really? So how is that incompatible with Theism? Saying there is no evidence doesn’t magically make it the case that there is no evidence. I highly doubt you’ve read the works of Richard Swinburne, Alexander Pruss, Tim Mcgrew, Charles Taliferro, Linda Zagzebski, Peter Van Inwagen, Timothy O’Connor, Brian Leftow, William Alston, Paul Moser, Nicholas Wolterstroff, Robert Maydole, Robert M Adams, Micheal Rea and John Hare just to name a few. Remember I’m playing the spade game, so lets see if I can go 2 for 2 here. I’m usually pretty good at this guessing game considering I’ve debated hundreds of Naturedidit followers in my time. So Willie’s interlocutor X is correct? Is Willie’s interlocutor a Bible Scholar, if not then what are his or her credentials? I have a few things to ask. Is it alright if I email you? Or, do you have TWeb? >Tell me- do you EVER do ANY research apart from Google and Wikipedia? Have you EVER thought of getting off your lazy bum and going to a library? That is- if you even know of such a thing. >You refused his debate challenges and run to the security of your failure of a blog. >You’re an idiot. He has posted a link- but it was never approved. Moreover, what is this blog filled with? All of your little wannabees. >Argument ad lapidem. Try again, lackwit. >And what exactly are you doing? >Nick allows any post through that isn’t spam. So does TWeb. Try again, lackwit. >He’s got a refutation on you. I’m not avoiding poor ol’ ClubS at all. I’m right here. Please tell me how that is avoiding her. Poor ClubS, again only has wannabee minions touting how great her blog is and she can’t come here at all. But as I’ve noted, her blog is nothing new. Yep, read it, yep,not impressed. Even done a REFUTATION. I have invited her myself. I’ve told her I’ve done so in the comments of the post and offered her a link to come to, but it was never approved. It’s hilarious to watch you and others do their best to avoid me. I’m flattered, but one more atheist post that covers the exact same things that other atheists have doesn’t impress me. And “neutral route”? posting on her own blog and hiding? Please tell me how I have any advantage here. I allow any post through that isn’t spam. So, no advantage there. And nope, not conceding anything, but it’s awful sweet to see you again declaring you’ve won and no evidence for that either. How expected. Poor ol’ ClubS and you are fundamentalists just like any fundamentalists. Her errors have long been noted. I’m never coming back to this page again. CLub S is just interested in strawmanning WLC and attacking the claims made by popcorn apologists and Fundy Bible-Belt Christians. She never admits that she is wrong, even when it is demonstrated to her down to a T, so there is very little to gain here with respect to debating her anyways. Nick dissected and destroyed her claims regarding the 500 and she is too afraid to debate someone who knows more than her. She probably feels happy living a life that entails NATUREDIDIT, so she only wants to address the ‘easy’ claims made by her interlocutors. If she was a great as she says she is then she’d come down to Theologyweb OR at least make up a reply on her blog that addresses Nick’s criticisms. So in conclusion this is all just a waste of time. Club S all you do here is cheat yourself when you fail to address the criticism of those who aren’t ‘so easy’ to deal with. So, you want to claim that I am “strawmanning WLC”? Okay, show where I have. If you can’t, then you are simply lying to give yourself an excuse for your failure. Please also explain what “popcorn apologists” are. I am guessing that you, like many other Christians, want to pretend their apologia and excuses are so much more “sophisticated” than those “other” Christians that you don’t agree with aka “popcorn apologists”. You want to claim that you are the only TrueChristians but you have no better arguments than those you insist are wrong. I do also love to see TrueChristians attacking “Fundy Bible-Belt Christians”. It does a lovely job at showing that the claims that the US is a “Christian Nation” and that Christians are the most populous religion are false since Christians can’t agree with each other what a TrueChristian is. Nice to see one more lie that I am afraid of poor ol’ Nick from Deeperwaters. And I do not expect special treatment from him. I expect the same respect I show to other bloggers to be shown to me. I almost would guess that you or potato are indeed poor ol’ Nick, considering how desperate you are for me to pay him attention. It’s hilarious on how you all so need the validation of one atheist for your nonsense. Alas, Nick did dissect but did not “destroy” my claims. He made the same failed arguments that we’ve seen here already. People are more than welcome to go visit Nick’s page. I’ve already addressed his claims here and there is no reason to bother with his blog to do the same again. Same with theologyweb. Been there, done that and apologists, “sophisticated” or not, still fail. If there is any particular argument of Nick’s you think has not been address, please do let me know. You have not shown me that I am wrong, and sorry my dear bully, I don’t cave to those who attempt to scare me into admitting something that is not true. But again, thank you so much for displaying your attitude here and being one more example of how religion makes few better people. I’ve addressed the “easy” claims and the supposedly hard claims of Christians and they still fail. But if you think you have one I haven’t (and please do make sure I haven’t by reviewing this blog) tell me about it and I will devote a whole blog post to it. However, I’ve asked for this before and I have had no takers, which indicates to me that you know that your supposedly wonderful “sophisticated” arguments also fail. It’s awfully easy to claim that you have some great unchallengable argument, but if you don’t present it, then one is left with assuming it doesn’t exist. No, Cornell, I don’t cheat myself of anything. But again, nice attempt to try to scare me’ it’s a pity that’s all you have anymore. You, and “Nick” haven’t posted anything any more difficult anyone else. I do offer to address anything you’d care to request that I address. I’m waiting right here. You only have to post one of those supposedly great arguments from yourself or Nick’s blog. I’ve already addressed your claims here in comments repeatedly. But you can even pick one of those out and I will do a blog post just on it. You see, you need to pick the argument out because I am not playing the game where after I pick one, you whine that it wasn’t “hard” enough and try to disregard it. Show me one of these wonderful refutations and then I will deal with it. ClubS, that was essentially argumentum ad lapidem in a nutshell. This is just excellent. I do love how now I should go to a library to satisfy poor tater. Tater, tell me how going to a library is any more satisfactory than doing a good google search or using a wiki article that has references? I know a fair amount about research and sources, having been in college where I wrote many papers and having my minor in library science. Then we get to see Tater insisting that I’m avoiding someone when I say that I’m right here waiting. Again, Tater, I never saw a link or a comment from Nick. There has been nothing in the spam folder or the trash folder. Now, you can of course claim I am lying, but since that is not true you are stuck with sinning against your god. It’s great to see you claiming an argumentum lapidem again. New term you just read on someone else’s blog? Well, let’s look at something Nick said in his ever-so wonderful refutation “One wonders why Paul should have to write out a list of say 400+ people in an age where writing was timely and expensive.” http://deeperwaters.wordpress.com/2013/07/22/a-response-to-clubschadenfreude-on-the-500/ Alas, we already know that this is silly since writing was being done for receipts and lists of common every day things. Letters were commonly sent. And we know this because we’ve already shown the exact same claims from Tater to be wrong. And poor Tater, I asked him what advantage I had on my blog that I would have no where else and he says “It’s your blog.” Again, what advantage do I have, Tater? Yes, it is my blog and I will post any comment I receive on it. This gives me an advantage how?